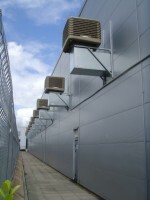 ECOCOOLING direct evaporative cooling can be used as an alternative to air conditioning in most industrial buildings or IT rooms reported to provide 90% energy savings at a fraction of the capital cost of a traditional air conditioning or ventilation system. The company says a simple system of just one unit can provide up to 30kW of cooling from just 1kW of electricity and can cover an area of 250sqm or a 15m diameter circle in a typical manufacturing or logistics operation. The only service requirements are 240v electricity and a mains water supply. Ecocooling reports it now has over 1500 installations both in the industrial and IT sectors in the UK including Cummins Diesel, Premier Foods, Cott Beverages, Net-a-Porter, Unum, Cambridge University and Aberdeen University. ECOCOOLING is an industry leading manufacturer of ventilation and evaporative cooling equipment, with over 4500 installations worldwide. The company says EcoCoolers provide a natural, safe and simple alternative to air conditioning for large industrial areas or factories and uses natural evaporative cooling methods to cool any area where cooling is required while reducing cooling costs by up to 90%.